1. First, I am to consider what the Word incarnate did in the womb of his mother, when the hour was come of his deliverance from thence. Pondering, first, that as he would not anticipate the time of his birth, so also he would not defer it, but would punctually be born at nine months end, to manifest himself unto the world, with an hearty desire to begin his course with great fervor, and alacrity of heart; fulfilling that of David: He hath resolved as a Giant to run the way: his coming forth from the top of heaven, not staying till he come to the other extreme. 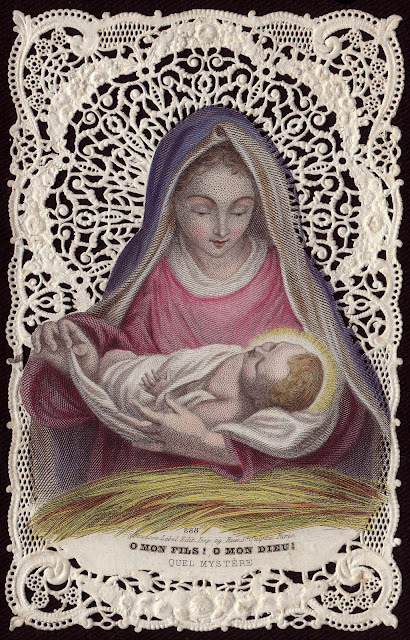 For albeit he knew what a sharp course he was to have from his Nativity to his death, yet he rejoiced with fortitude to begin it, issuing out from the womb of the Virgin, which was his heaven, and presently setting his feet upon the vilest, and basest place that was on earth. For the which I ought humbly to thank him, beseeching him to give me light to know, and understand what passed in this his entrance. O child more strong, and valiant then a Giant, seeing that, resplendent like a new Sun, thou wilt issue by thy orient, to run thy course unto the Occident of the Cross, illuminate my understanding, and inflame my will that I may behold and contemplate they aggression, and may love with fervent zeal the virtues thou discovers therein, Amen. 2. Then will I ponder how liberal he then showed himself to his mother, like as a mighty, and rich man, having been lodged in the house of a poor laboring man, who hath given good entertainment, not for any interest, but to serve him uesth at his departure to recompense him well, and to give him some precious gift, either in gratitude, or for lames: so likewise for that the blessed Virgin had so well harbored her Son for nine months; as such time as he meant to depart from his lodging, he gave her the richest gifts of grace; a most high contemplation of that mystery, and certain extraordinary jubilees of gladness, instead of those pains that other women use to feel when they are in travel of child. For it was not reason, that she that had no sensual pleasure in conceiving, should have any pain in bringing forth. And albeit as touching the suffering of dollars, he dispensed not with himself yet he would not that his mother in this case should suffer any. In like sort I may consider, that when our Savior Christ entered Sacramentally into us, at his first entrance he giveth us Sacramental grace, and if we give him good hospitality, before his departure, he giveth us rich jewels of affections of devotion , and contemplation; and jubilees of alacrity, wherewith he recompenseth the good entertainment, that we give him. Therefore (o my soul) regard how thou harbors this sovereign guest, that he may leave thee rich and abundantly stored with the gifts of heaven. 3. Thirdly, I will ponder how our Savior Christ would for the same cause, issue out of his mothers womb after a miraculous manner she not suffering any loss of her virginity, for it was no reason that he should depart out of a house, where he had been so well entertained with the damaging of the integrity that it had; honoring herein his mother, and advising is all, that to entertain him, and to serve him, we shall receive no detriment: rather if need be, he will do some miracle to that end. For through he did none to preserve himself from suffering, yet he useth to do it, to preserve his elected, when it is convenient for them. O sovereign master, how well thou teaches me by this example the condition of true love, which is rigorous to itself, and gentle to others! for itself it will have rigors to afflict it: but for its neighbor, it will have favors to delight him: aid me with thy abundant grace, that in both things I may imitate thy fervent, and admirable charity, Amen.